We’re proud of our team! Well, today in particular proud of 6 of them who did a fundraising walk yesterday in Barcelona. When our President Francesc Riverola sent an email to our team to propose the “Magic Line” walking challenge, we have to be honest, answers were not massive. The deal? For every kilometer walked by one team member, FXStreet would donate 5€ to the organizer of the event, Sant Joan de Deu Hospital – one of the leading medical centers in Europe for childhood and adolescence working to help the most vulnerable people. A few days before the walk, motivated by our CTO Javi, a team of 6 people did cheer up to go and make the 30km walk around the city and its montain range, “el parque de Colleserola”: Javi, Gerard, Felipe, Adrià, Chus and Jordi. Under a soft winter sun, our valiant colleagues achieved the 34 km trail during a bit more than 8 hours, with only one half-hour well deserved and tasty beer” break. It was officialy 30km, but their distance tracker indicated it was 34. Four kilometers seem a detail, but when you’re about to finish and you’ve already made 30, it’s quite something. 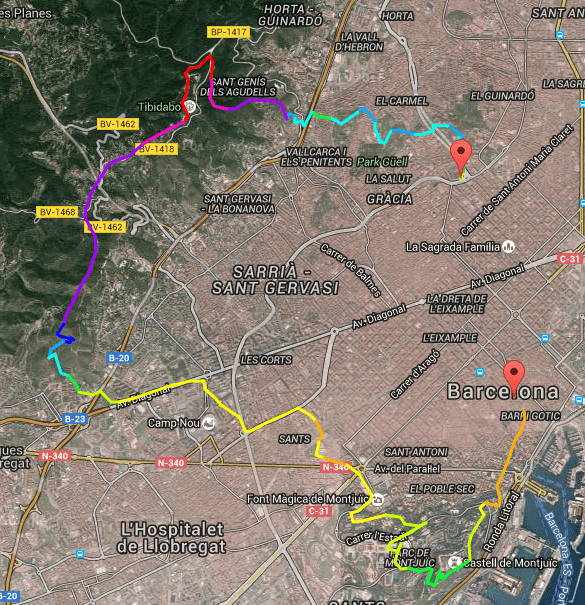 For those who know Barcelona a bit, you can click on the small map to enlarge it and see the trail. Here below you have the pictures. Congratulations to the 6 of you guys… FXStreet will be giving 950€ to Sant Joan de Deu thanks to you!